Nice little RV park off the main hwy. Good signage to park. Park is asphalt and gravel pull through. Have all services but we only used the electric and water. They also put chlorine in the water system. Quite a few permanent residents, but they do leave a couple of places open for overnight travelers. We were traveling in Oct and host said that they did have laundry faculties, but they had shut it down for winter. Was self check in but host did come around and check to make sure everything was OK. Be aware they charge a $1.00 fee per dog. There are walking trails nearby and the neighborhood is nice. Did hear the train in the evening, but nothing at night. And couple of the permanent residents were having a grand old time during the evening, but shut it down after night fall. The night was very quiet. Other than the chlorine and the charge for the dogs, it was a nice place to stay overnight. We camped at Riverside RV Park in a Motorhome. This is a small, clean campground with full hookups including cable and good wifi. You leave a check in a dropbox so price above reflects full cost--no additional tax or fees. Owner dropped by in the evening to make sure everything was OK. It looks like they recently renovated the pull-through side of the campground...newly planted trees, new asphalt pads, fresh gravel, fresh paint on picnic tables. Very nicely done, however, we've never encountered a campground without a bathroom or even vault toilet. Campground is less than 10 miles from Fossil Butte National Monument. We camped at Riverside RV Park in a Fifth Wheel. First JC Penney store and home of Penney's founder in downtown Kemmerer. Great signage from the main roads leading to the park. Self check in, but reservations are allowed and your site with be marked with a placard. WiFi is strong, but we were park next to the office. All sites full hookup, asphalt pad, gravel everywhere else. Downtown within walking distance. Nature trail nearby. Gas station and liquor store walkable as well. Highly recommended if you're stopping here or visiting Fossil Butte national monument. We camped at Riverside RV Park in a Travel Trailer. I called in advance to make our reservations at Riverside RV Park. I didn't receive any type of email confirmation, but I did get a call from them a couple of days before the reservations just to confirm details with me, as well specific directions on how to find the park. Once we arrived there, we were told to look for a yellow sign that would be at our location, which we found with no problem. After we checked in the manager did come by and introduce herself to us. There is another park in the same general area, so just make sure and go to the right location, at the end of the road by the river. The park is small, but the internal roads in the park were easy to navigate, very wide open. I didn't hear any road noise in the park, but did hear some train whistles even though the tracks are far away. There are NO restrooms or showers at the facility, and since we were only staying a couple of nights that was OK with us. There was cable with a few channels. We had 50 amp service at our pull through location. The picnic table at our site wasn't in very good shape. Also, they DON'T take credit cards, cash or check only. There weren't many options of places to stay in this location, and since we went to Fossil Butte National Monument, the location worked good for us. We would stay there again. We camped at Riverside RV Park in a Fifth Wheel. Go to Fossil Butte National Monument, well worth stopping at. Park was very clean. Nice shady spot with river behind us. Self check-in. Owner's daughter came by later to make sure everything was OK. Only reason service was satisfactory is that we had to call twice and didn't get a response until mid-day the next day. Otherwise they could not have been nicer. Would definitely stay here again. We camped at Riverside RV Park in a Travel Trailer. A nice little campground on the Hams Fork river. As others have said its the honor system to check in. Plenty of room for the biggest rigs. Quiet area, everything worked. If your a fly fishermen this could be a great base camp as there are many great streams in the area. We would stay here again. We camped at Riverside RV Park in a Travel Trailer. Easily accessible from the highway, the park is very well kept with spacious, level sites and is quiet and peaceful. 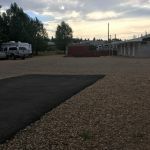 The campground is gravel, but 10 of the pull through spaces are paved with asphalt. There are also several back-in spaces next to the Hams Fork River that runs alongside the park. There is a trail down the side of the river that runs a few blocks up to the main road which is a nice walk to view local wildlife. According to the owner, reservations are NOT required (as written in an August, 2014 review). The only exception is during the Oyster Ridge Music Festival held the last week of July. Otherwise, upon arrival a sign on the office window indicates the pricing and asks that you pick a site, fill out and put your payment in the envelope provided and drop it in the night slot. The owners live near and check on things periodically. They are extremely friendly and helpful offering an information sheet about things to do in the area. You will see them working around the park throughout the day. We were parked on an asphalt, pull through site with FHUs & cable (4 channels). WI-FI is only available by calling the local provider. The WI-FI rate is an additional $5/day or $20/week for 2 devices. We stayed for over a week and the service worked fairly well. During our stay we enjoyed drives up to Fossil Butte National Monument just about 9 miles away. The area also offers fossil digs, hiking, fishing, boating, golfing and wildlife viewing. The town of Kemmerer hosts a museum and the first J.C. Penny "Mother" store built in 1904. We enjoyed our stay and will be back again the next time we are through this area. 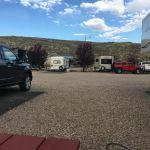 We camped at Riverside RV Park in a Fifth Wheel. You can go on a fossil dig, have a guided fishing trip and play a 9 hole golf course all within the local area. Easy access to highway and site. Small campground with self check-in, all sites pull-through and full hookup. Select a site, fill out envelope, and deposit in slot along with cash or check. Owner's daughter stops by in evening to check on everyone and see if anything is needed, etc. Also provides any information needed on town or things to do. Campground sits next to small beautiful river; saw deer, marmots, beavers, and geese. Nice quiet walk following the river for a few blocks, back to the main road. Definitely recommend and hope to go back. We camped at Riverside RV Park in a Motorhome. This RV Park has full hookups with pull-through spaces. Very clean and level. No tents are allowed and credit cards are not accepted. This was fine with us. Quiet and close to downtown area. Some of the pads are asphalt. When we made the reservation, we were told to just pick a spot when we arrived. We did, and everything worked out just fine. We camped at Riverside RV Park in a Fifth Wheel. Some of the area attractions are not open on the weekends. A very nice clean camp. We had called ahead for a reservation and was told to pick a site when we got here. Sites are very level, had no problem setting up. Daughter of the owner stopped in to make sure everything was okay and gave us brochures for the area. Only negative was that they charge $1 per day for pets. We would stay here again. We camped at Riverside RV Park in a Motorhome. CG is on the Hams Fork River across from Union Pacific switching yard. Seldom are whistles heard but there is a lot of freight traffic through Kemmerer. Owner is not on site, but someone does come around once a day to check on arrivals and departures. There are several long term residents in the CG, well kept sites. There are 10 paved pull-through sites with full hook-ups. There are young shade trees. The cable TV draws 4 channels and Wi-Fi is not great. We used our own devices and had a 5 bar, 4G signal. Cell phones worked well. One RVer apparently came here without reservation and had to leave, in spite of the fact there are always 7 or 8 open sites available. There is no laundry and no restrooms and/or showers. The building is locked up and long unused. No one ever mans the reception station. As long as you have a reservation you may pick your site and deposit your money in the drop box. Close to Fossil Butte National Monument but a long way from everything else. Abundant wildlife along the river and a park across the highway with walking trails and a golf course. An okay place to rest and relax before moving on. We probably won't be back here. We camped at Riverside RV Park in a Fifth Wheel. Past reviews made me think this might be the lesser of the evils but we wanted a site near Fossil Butte. This was a very nice little park. There do seem to be some long term campers here but everything looked neat and clean. Sites well kept. Some sites were well maintained gravel, some were paved. Some back ins and some pull throughs. We parked on a paved site. It is near the rail line but far enough away that it was not a bother, just rather a pleasant reminder of life moving around us. Not near a crossing so no whistles. Small river runs by. Took a walk and saw a beaver dam, two beaver, and four buck deer in full velvet. Spent one night. Would come here again. We camped at Riverside RV Park in a Motorhome. We stayed here because it was the only RV park in this town. Had a pull-through site for one night and had to pay $5 extra for one night of internet access. This park has no restroom, showers or pool. No trees, no shade and the place looks very shabby. The neighbor next to us said he stayed here in the early 80's and the place hasn't changed. Fortunately, we were between two nice looking motorhomes so we felt safe. We camped at Riverside RV Park in a Travel Trailer. This was the closest campground to Fossil Butte so we planned on going here after stopping at the visitor center. There was no one there to give us a site. The sites were just dirt and it looked like a shanty town. We decided to drive straight through to Salt Lake City. We camped at Riverside RV Park in a Travel Trailer.